Here is another card that we made at my club party last weekend. 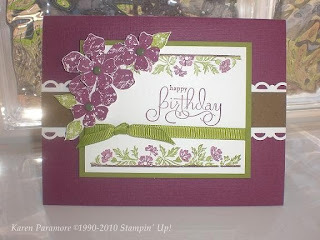 This one is made using the rich tones of the Rich Razzleberry In Color from Stampin' Up! This card is a very pretty one too! My hostess for a club party likes this card and the card in my last post so much that she wants to make both of these at her party too! This card's greeting can easliy be changed to fit any occassion. I think for the party this weekend I will suggest the Happy Easter stamp out of this same set. I don't know if you can see it from the picture, but the soft suede strip was embossed using the polka dot embossing folder. The stamp sets can be found in the Occassion Mini catalog and the Scallop Edge punch is only available now in the Sell-a-Bration catalog for FREE when you spend $50.00 in Stampin' Up! merchandise! Contact me to place your ordersoon because the special Sell-a-bration promotion ends on March 31st!